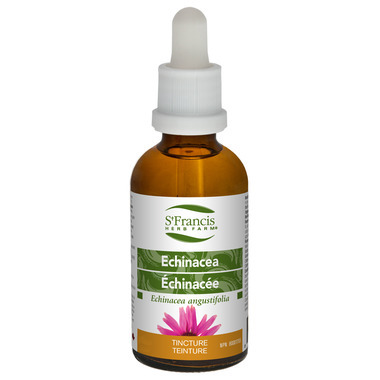 Echinacea Angustifolia is traditionally used to combat colds, flu, and infection and for the relief of sore throats related to colds. Used as supportive therapy in the management of upper respiratory and urinary infections. Suggested Usage: All the following doses should be taken 3 times daily in a little water on an empty stomach. Adults & adolescents (14 & over): 1.5-4 ml (45-120 drops). Duration of Use: Consult a health care practitioner for use beyond 8 weeks. Non-Medicinal Ingredients: Distilled water, Grain alcohol Traditionally used to combat colds, flu, and infection and for the relief of sore throats related to colds. Used as supportive therapy in the management of upper respiratory and urinary infections. Cautions and Warnings: Consult a health care practitioner before use: if you have a progressive systemic disease such as tuberculosis, leukosis, collagenosis, multiple sclerosis, AIDS and/or HIV infection; if you have an autoimmune disorder; if you are taking immunosuppressants. Consult a health care practitioner if symptoms worsen or persist.